Custom designed panels - e-mail us an image, logo or photograph which we'll forward to Bisazza in Italy to replicate into a customised mosaic panel. The Bisazza Artistic department will then translate your image into a mosaic format, from which together we can make modifications, adjusting colour and size to suit your requirements. 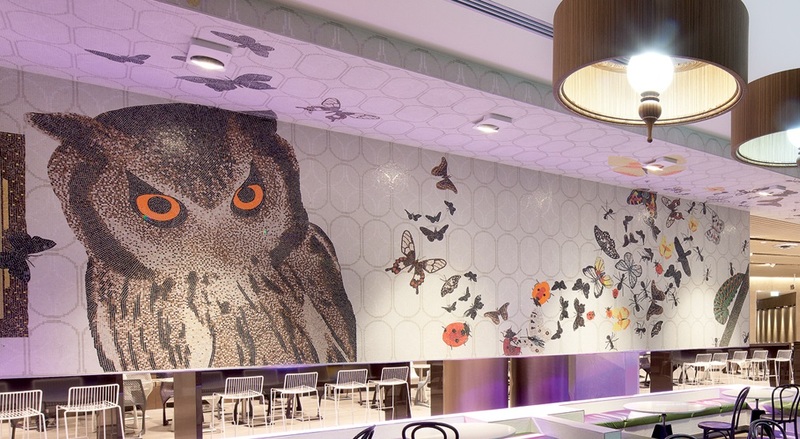 Scroll down to view more images of the Melbourne Central Food Court, designed by �The Uncarved Block�, where we supplied 200 SqM of custom-designed, hand-cut Bisazza Italian glass mosaic mural. Custom random blends - select the percentage of each colour and the number of colours within the blend, to create your customised Bisazza solution. This is possible for all Bisazza glass mosaic types, such as Vetricolor, Smalto, Gloss, Le Gemme and Opus Romano.